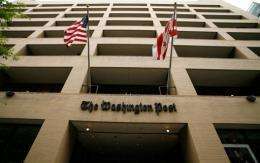 A Washington Post journalist resigned after posting information that appears to be plagiarized and after being reprimanded for "a significant ethical lapse," two US media monitors reported Monday. A Washington Post writer whose blog posts triggered editor's notes for "serious factual errors" and what was described as a "significant ethical lapse" has resigned from the newspaper. Elizabeth Flock, 26, told AFP that she resigned on Friday before the Post published a second editor's note about her work and that she was not pressured to quit. In December, an editor's note was posted above a blog post by Flock titled "Mitt Romney is using a KKK (Ku Klux Klan) slogan in his speeches." "This posting contains multiple, serious factual errors that undermine its premise," the editor's note read. "Mitt Romney is not using 'Keep America American,' which was once a KKK slogan, as a catchphrase in stump speeches, as the posting and headline stated," it said. "Romney actually used a different phrase, 'Keep America America.'" The most recent editor's note stated that a Flock blog post had made "inappropriate, extensive use of an original report by Discovery News and also failed to credit that news organization as the primary source for the blog post. "This was a significant ethical lapse and not in keeping with our journalistic standards," the editor's note said. "We apologize to Discovery News." Flock worked at blogPost, which describes itself as the newspaper's online "home for breaking news and conversation." Contacted by AFP, Post spokeswoman Kris Coratti said: "We do not comment on personnel issues."